I love Listerine. Ever since I was a teenager and took my first swish of that odd golden mouthwash, I was convinced that the unbelievable burning sensation that made my eyes water was killing every single icky germ in my mouth. Fortunately, there have been advances in mouthwash flavoring technology since then and there are now other colors and flavors of Listerine that you can use, while still keeping their great germ-killing power. I haven’t had an opportunity to try Listerine Cinnamint Mouthwash, but one of YOU will be lucky enough to win one and will hopefully let me know how you like it! Get a bright and fresh smile this Valentine’s Day with products from Listerine®. A recent survey showed that bad breath is the number one reason why women over 25 turn down a date. Cupid can finally take a break because LISTERINE® has the secret to get you and your smile romance-ready. The Little Things Do Matter! If you want to keep your romance alive, use small romantic gestures to celebrate your love everyday -not just Valentine’s Day. Write spontaneous love notes, enjoy random date nights or simply say “I love you” out of the blue. Avoiding common turnoffs is also key. You never know when you could meet “the one,” so try rinsing in the morning and at night with NEW LISTERINE® TOTAL CARE Cinnamint Mouthwash. It delivers six health benefits, including killing bad breath germs. On the Go Quick Fixes: Ever have something at dinner on a date and are afraid to even think about that goodnight kiss? A true beauty trick is to always carry a product like LISTERINE® Cinnamon POCKETPAKS® in your purse, for a convenient on-the-go solution to unwanted bad breath. For more information visit www.listerine.com. 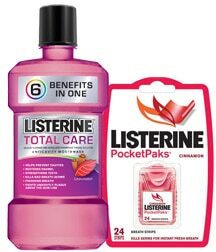 THIS ENTRY IS REQUIRED FOR ALL OTHER ENTRIES TO BE VALID (+1): Visit www.listerine.com and then tell me which of the two products you would like to try the most – the Listerine Total Care Cinnamint Mouthwash or the Listerine Cinnamon PocketPaks. Giveaway ends at 11:59 PM EST, February 10, 2010. I want to try the Listerine Total Care Cinnamint Mouthwash. Thanks. I would like to try the mouthwash.